Need some tips to boost your wifi signal? Working wireless gives extra mobility and freedom to work from anywhere. Many of us might be using wireless routers to stay connected to the internet on our laptop or PC which is great but sometimes the signal strength is inadequate, which results in slow connectivity or no connectivity. This may occur due to wide range of problems ranging from your router, other objects or even other wireless equipment’s. These problems can be easily over come and you can rebuild the signal strength of your wireless router and work without any interruption. Herein are some handy tips that enable you to boost up the signal strength of your wireless router. Placing your wireless router in a room may result in signal loss or weak signal. It is always advisable to place the wireless router at the center of your home, such that you will have the same signal strength all over your place. Placing router near to metal objects like file cabinets or near dense brick walls can also add to signal loss or weak signal. So care must be taken not to place the wireless router near to any bulky objects such that the signal path is obstructed. We use many other wireless equipments other than the wireless router like cordless phones, garage door openers, etc, which also operates using radio signals. Most of the wireless equipments emits radio signals in the same frequency, hence signal interference can take place. Placing the wireless router near to these equipments can also lead to signal scrambling and signal strength loss. Place the router away from these appliances and you can also change the frequency of the wireless router such that its signals will not be interfered with others. In US and Canada most of the routers relay signals using channel 6 2.4 G Hz by default and most other equipments like cordless phones may also use the same frequency. So try changing the channel such that the signal frequency will change and help reduce the signal interference and may improve the signal strength. You need not have to change any settings in your computer as it will detect the signal automatically. The Router manufacturers will constantly update the firmware fixing problems which help in improving the performance and signal strength. To do this just visit your Router manufacturers web site and download or update to the latest firmware. It is always better to keep your operating system up to date such that any improvements or updates made to the network adapter drivers will be updated automatically. This can improve the performance of your system as well as improve the network adapter performance. Signal strength and the wireless performance can improve a lot when you use the Router and the network adapter of same make. Many manufacturers include signal boost techniques in there equipments such that you can have high performance. Router and adapter from different vendors may work fine but they cause problems some times and may not perform to the full capacity. Antenna supplied with the router will be an Omni directional antenna which will emit signals in all directions. So when you have placed the router in your living room then half of the signal is transmitted outside your house which is of no use. This can result in signal loss and poor performance. The solution is replacing it with High gain antenna which will emit signal in only one direction. You can install the antenna in such a way that all the signals will be transmitted inside your house. This is only possible if your router has a removable antenna. Check it before you install. Router can transmit signals only to certain distances, mostly up to several meters. As you move away from the signal source (that is router), signal becomes weak and performance will be decrease. To overcome this problem you can place a repeater to boost the signal strength such that you can roam for more distance. The signal problem may not be always related to the router itself. Remember it is a two way transmission, so check the wireless network adapter of your PC or Laptop. Try replacing the network adapter and check if the problem is resolved. You can also use wireless USB network adapters for better performance and reliability. Reflector will reflect back the signal in the direction that we need, just like a mirror reflecting the light. 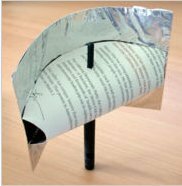 Wireless signal from the router can be reflected the same way using a Tinfoil reflector which acts like a mirror. This can be easily made in your house using daily household items and in few minutes – all that you need is tinfoil, cardboard, sticky taps. Cut cardboard in rectangle shape about 15 x 10 cm in size and wrap tinfoil around it. Cut another piece of cardboard (or paper) in a circular shape. Now bend the circular paper slightly and place it like shown in the figure. Now pass the tip of the antenna along the focal point of the parabola, reflector. This not only helps to reflect the signal but also acts just like a dish to receive signals and focus them on to the antenna. Guest blogger Srikanth writes on Tech Inspiration blogs at ekoob.com about tips, gadgets, and technology. You can also write a guest article and share your tips and tricks.